The idea is to have a syntax that will enable the description of all possible glyphs in all possible notations. As you will see, the syntax is quite complete and not all “fields” are mandatory, this does not mean that the logic of glyph presentation will be poor: the font can contain already assembled glyphs (for subpuncta for example). All types of neume writings will have their table of correspondance to make the different variants explicit, and users will have to refer to them when typing neumes of a certain type. The previous two switches don't take into consideration all possible neumes, some are variations of the same neume, so we must take into account severa variants. Variant can thus be nothing (for the default glyph) or a number between 1 and 9, to take into account the variations. For semi-diastematic notation (typically Beneventan notation), the ambitus is important. It can be indicated with amX, with X being 1 to 3 numbers between 1 and 5. For example a podatus with an ambitus of 3 will have am3 in its description, and an (hypothetical) climacus with ambitus 1 then ambitus 3 then ambitus 2 will have am132 in its description. For neumes where the place of the height of the neume relative to the others, is important 1), it is necessary to be able to describe it. When necessary, the user can add hN where N is the letter of the first note of the glyph, the same as in gabc (between a and m). As there is no reference, the height is of course very approximative. We shall consider that the default is the height f.
When multiple base neume glyphs are combined together, drawn as one glyph, the neumes are joined together with ! character. E.g. a torculus combined with clivis and porrectus with episema is written as to!cl!po-. If height needs to be specified, it should be specified for all the base neumes, like tohh!clhh!po-hh. Subpuncta, prepuncta and significative letters go after the whole group in that case. For adiastematic notation, the subpuncta can be added at the end, with su followed by the number of subpuncta (between 1 and 9). For semi-diastematic notation, this is more difficult, as the relative height of the puncta can change. So a list of puncta can be give, with the following syntax: suX1suY1suZ1, with X, Y and Z being the height of the puncta. No more than 10 puncta can be given. If a shape of the particular puncta needs to be specified, it can be specified by a modifier after the optional hight letter. If pp is used instead of su, it describes prepuncta of the neume instead of subpuncta. 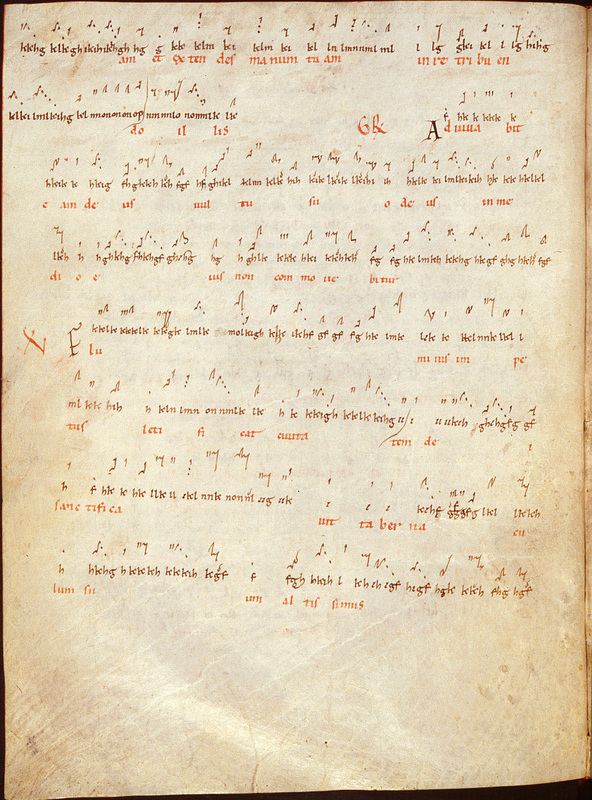 To insert a smaller space between nabc neumes, use / character, to insert larger space use //. /// then stands for a larger space followed by smaller space. To add negative space, use ` and/or `` instead of / and/or //. This is generally useful for the first nabc neume above some square note neume group, if there is plenty of space before that, but not enough space for the nabc neumes. semi-diastematic notation, see this 11th century explicit example, the notation was quite close to gabc at that time!